This week, my swoon is from If There's No Tomorrow by Jennifer L. Armentrout! His eyes were blue as the deepest seas I'd never seen in real life but had circled on that map above my desk. Somehow our faces had gotten closer and closer during my exploration. Our breaths mingled together. The contact of my mouth against his was just as shocking and electrifying as it had been the first time, maybe even stronger now. It was just the sweetest, gentlest of pressures. Only my mouth moving against his, and then his hand was on the nape of my neck. I made a sound I'd never heard myself make before, opening my mouth to him, and whatever control Sebastian had, whatever as holding him back, snapped. Sebastian kissed me, really kissed me. My heart threatened to explode. Catch my review tomorrow! This book was quite good. I don't usually go for YA contemporary, and it has been a while since I read a JLA book of any age level, but this one was quality! For some reason that excerpt made me squeal, I don't know. I actually got an ARC of this book but sadly enough didn't get around to it before the release. Kinda regret it now. Ooh thanks for sharing. I'm glad you liked this one. I've never actually read a book by the author. oh my that is one swoony quote but then this author can really write those moments so well. Can you believe that I haven't read JLA yet? That is a really great scene you shared. I am looking forward to your review tomorrow! Haven't read any of her work, but most of the things I've seen about her are positive. Glad you enjoyed it. Ooh, this one sounds really good! If There's No Tomorrow is on my TBR. 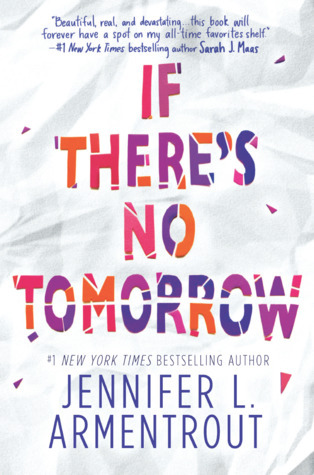 I haven't read a book by Jennifer L. Armentrout in a long time, I'm excited for this one. I'm looking forward to reading your review tomorrow! Happy reading! Awesome swoon Alyssa :D Yay for liking this one. <3 Sort of liking this swoon, but a bit unsure about the writing :) Most likely not for me, lol. This excerpt was really good! I keep going back and forth about whether to get this one. It's been a while since I read anything from JLA and I had originally stopped because I was feeling like my read taste had changed. But I've heard nothing but good things about this one so I might have to pick it up! I had to read this one too... It moved me! Great swoon choice!